Ready to add some good vibes to your project? Look no further than the Haptic Motor Driver. This board breaks out Texas Instruments' DRV2605L haptic motor driver, which has some seriously cool features. Add meaningful feedback from your devices using the Haptic Motor Driver and an Arduino compatible device. 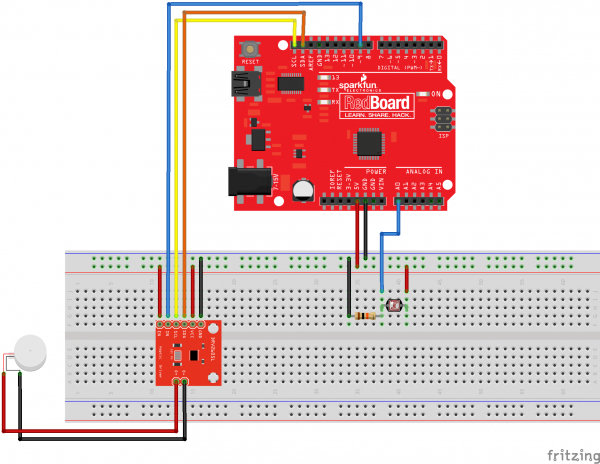 This tutorial will get you up and running, or vibing, in no time with the I2C library for Arduino and example projects that give you the hardware setup and the code for various modes of operation. And that is just to name a few. See the DRV2605L datasheet for a complete list. You'll need a handful of extra parts to get the Haptic Motor Driver up-and-running. Below are the basic components used in this tutorial, if you want to follow along. The DRV2605L is designed for a handful of uses. The Technical Documents provided by Texas Instruments includes application notes, user guides, literature and blogs. 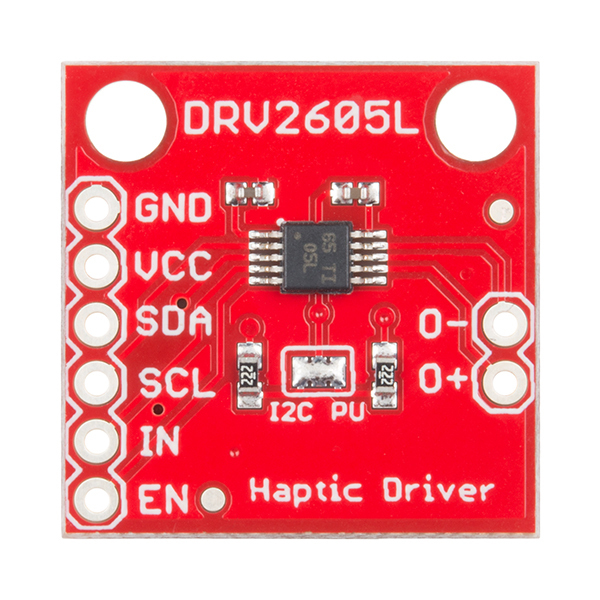 The DRV2605L communicates over I2C. We’ve got a great library to make it easy to use. We’re going to be using a breadboard to connect the breakout board to the RedBoard. If these subjects sound foreign to you consider browsing through these tutorials before continuing on. Min-Max Source Voltage 2V - 5.2V. Special Features Integrated Haptic Effects & Smart Loop Architecture. Input Signal PWM, Analog, I2C. Haptic Actuator Type ERM & LRA type motors only. Quiescent Current 0.5mA - Important for your battery powered projects. 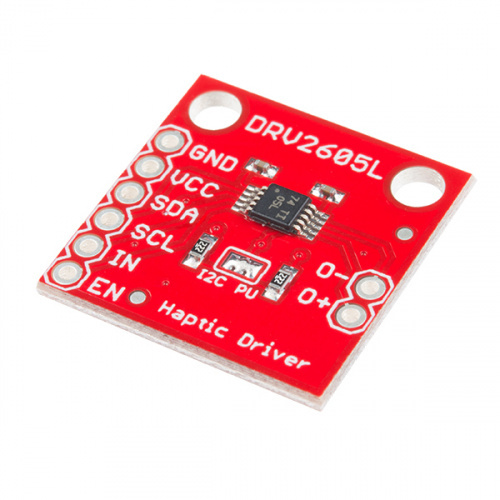 The SparkFun Haptic Motor Driver - DRV2605L breakout board provides 6 pins to provide power to the sensor and I2C bus. EN Enable pin. Connect to VCC for most applications. The DRV2605L is capable to driving two different types of motors. So what are they? How do they work? How are they different? Precision Microdrives published application notes on using both Eccentric Rotating Mass, ERM and Linear Resonant Actuator, LRA type motors. The default firmware for the DRV2605L is set for use with ERM type motors. There are six effects libraries for the ERM type and only one for LRA. If you want to get up and running quickly, I recommend our [ERM type motor](link to ERm motor from the site), otherwise you'll be updating several registers in the device and spending much more time with the data sheet. The difference between the two motors is how the movement of a mass is displaced. LRA vibration motors require an AC signal, driving a sine waveform that is modulated to get multiple effects. ERM vibration motors use a DC motor with a counter weight attached. The DC voltage controls the speed of the motor. The ERM has an off-centre load, when it rotates the centripetal force causes the motor to move. The rotation is created by applying a current to the armature windings attached to the motor shaft. As these are inside a magnetic field created by the permanent magnets on the inside of the motor’s body, a force is created causing the shaft to rotate. To ensure the rotation continues in the same direction, the current in the windings is reversed. This is achieved by using static metal brushes at the motor terminals, which connect to a commutator that rotates with the shaft and windings. The different segments of the commutator connect to the brushes during rotation and the current is reversed, maintaining the direction of rotation. 1: "AB-020 : UNDERSTANDING LINEAR RESONANT ACTUATOR CHARACTERISTICS." Application Note. Https://www.precisionmicrodrives.com. N.p., n.d. Web. 29 Nov. 2016. 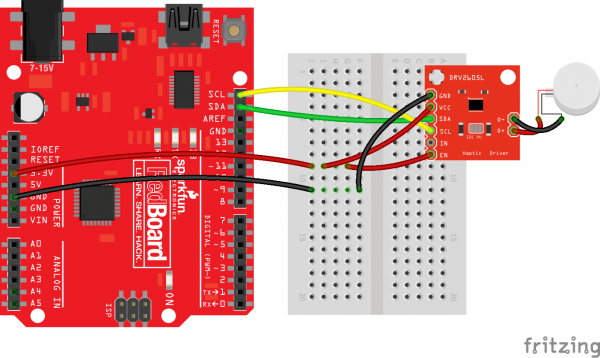 To use the SparkFun Haptic Motor Driver, you will need some supporting software. If you use Arduino, then you are in luck! We created an Arduino Library that makes the DRV2605L easy to use. To add the library from the Arduino IDE simply navigate to Sketch >> include Library >> manage libraries and search for SparkFun Haptic Motor Driver. 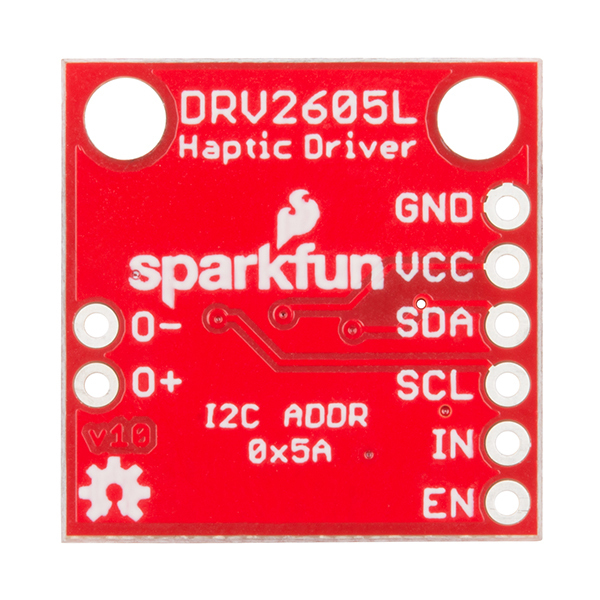 The SparkFun DRV2605L library has every register defined, and simple functions can be called to create a custom haptic experience. Every register must be set (or use the default if that works for you). Use the datasheet to help you with the values that need to be written to the registers. Going through the library header file, you'll see just about every register has a comment with its function and corresponding page number in the data sheet. This board is capable of operating in seven modes and can use either an LRA or ERM type motors. We will explore 2 of the modes -- Internal Trigger mode, and PWM mode. From here it shouldn't take much to get the device working in other modes. Let's explore each example in detail. The internal trigger mode allows you to play a waveform or a custom waveform sequence from the ROM waveform memory. In this example we will play all 123 waveform effects by loading them in all eight waveform sequencer registers. This simple sketch will also help you become familiar with the effects library so you can start to build your own custom effects sequences. See page 60 of the datasheet for the full list of waveform effects. Each library -- listed on page 14 of the datasheet -- has its own rated voltage, rise-time and brake-time. The hardware consists of the standard I2C connection and the enable (EN) pin must be pulled high. HMD.Mode(0); // Internal trigger input mode -- Must use the GO() function to trigger playback. In this example project, we are going to control an ERM motor based on analog input from a photocell that gets mapped to a range from 0-255 and uses that result to set the pulse width modulation of an output pin connected to the IN/TRIG pin on the Haptic Motor Driver. This project will give haptic effects based on the amount of ambient light in an area. Waving your hand over the photoresistor turns off the motor, and, when you move your hand away, you can feel the ramping effects as the PWM signal increases with the amount of light detected. // using PWM and a photoresistor. Now that you have been through three of modes of operation, try out the other four and use an LRA motor! How will you add haptics to your next project? Here are are the numerous resources and documents mentioned through out this tutorial.